Lecture as part of the exhibition "Olivier Foulon: Hard Return"
Antoine Watteau was one of the most successful artists of the 18th century – whilst being appreciated and interpreted as a withdrawn and solitary. He convinced an informed and influential public without being socially involved. This tension is inherent in his artistic approach. His most famous painting, “L’Enseigne”, was displayed in public space as a shop sign for two weeks before becoming legendary due to its inaccessibility. The strategy of limited display and ambivalent disguise runs through his work – in his depiction of social constellations and the rare appearances of Watteau in his own art and in that of his contemporaries. 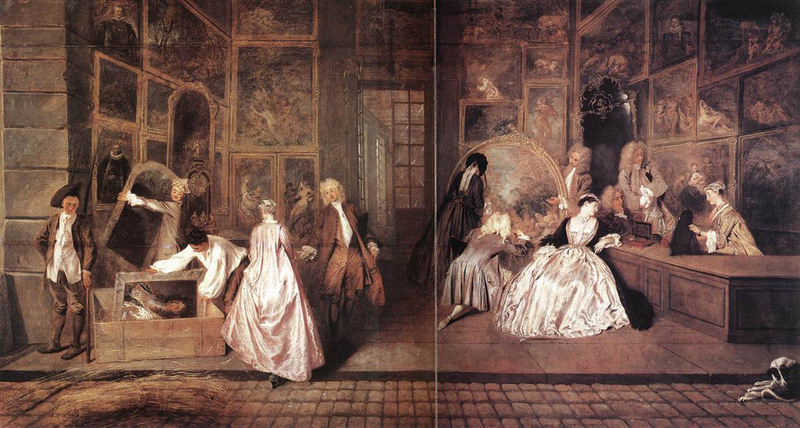 Watteau operated at a time when the art scene in Paris only had a few institutions; therefore he developed an innovative relationship to the public in his role as a famous invisible man. Shortly afterwards, immediately after his death, he became one of the most reproduced European painters of all time. Christoph Martin Vogtherr (born in Uelzen in 1965) studied Art History, Medieval History and Classical Archaeology in Berlin, Heidelberg and Cambridge. He worked at the Akademie der Künste Berlin, Stiftung Preußische Schlösser and Gärten Berlin Brandenburg, where he became custodian of French and Italian paintings in 1997. In 2007, Vogtherr began working at the Wallace Collection in London as a curator of paintings before 1800, where he was nominated director in 2011. Since October 2016 he has been director of the Hamburger Kunsthalle. His research focuses on French and British 18th century art and the history of European art collecting in the Early Modern Age.